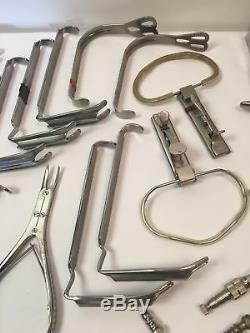 LOT 80+ Dental Surgical Instruments Elevators Extractors Lorenz Mueller Germany. 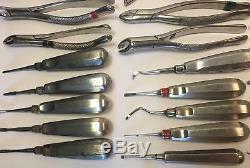 Name :LOT 80+ Dental Surgical Instruments Elevators Extractors Lorenz Mueller Germany. 1 Markel Child Mouth Prop B-952 T-152. 1 Markel Adult Mouth Prop B954 T-154. 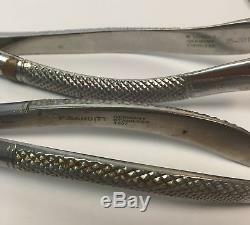 2 Dittmar Love Uvula Retractor. 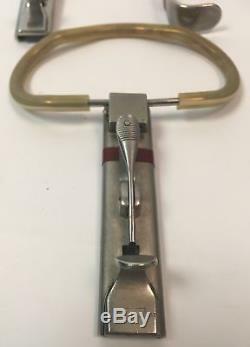 1 Lorenz Retractor 31-0022 CC. 1 Crown Stainless Steel Bowl. 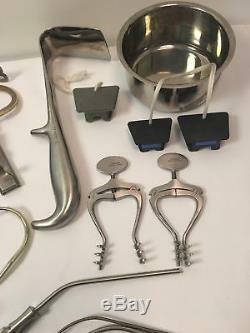 2 Mouth Gags-including 1 Storz N7502. 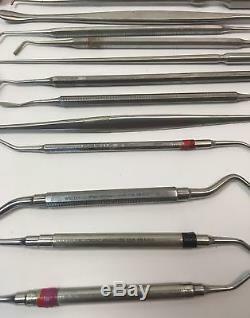 20 Extraction Tools including: Walter Lorenz 150 AS, Walter Lorenz 93-0010, Walter Lorenz 85-0010, Walter Lorenz 09-0457, Walter Lorenz 09-0440, Walter Lorenz 92-0030, Rugby Japan 88 R, P Bandit 73 X, P. Bandit 400-67 D, 400-51 D. 2 Mastoid Retractors Mader 21-470. 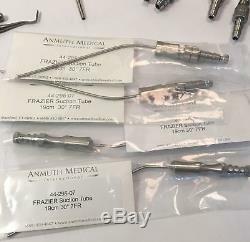 7 Retractor Blades for Davis-Crowe or McIvor Mouth gag including: 3 Ring No 3 Left, 1 Ring No 2 Left, 1 Ring No 4 Left, 1 Jarit 450-165, 1 V. 19 Suction Tubes Including: 4 Frazier 44-295-07, Miltex 19-577, Pilling No 0 6FR, 2 Pilling 162415, Pilling No2 8FR, Jarit 6, V.
Mueller NL 1902, Dittmar 1, 2 Surgimed 6, Lorenz 14-0073. 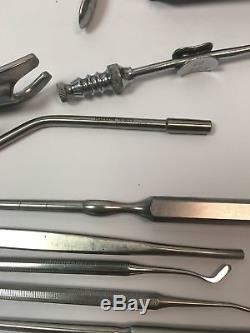 12 Oral Surgery/Dental tools including: 1 W. Lorenz 09-0226, 1 Walter Lorenz 09-0247, W. Lorenz 3662, 1 Codman 65-1016, 1 Codman 38-1080. 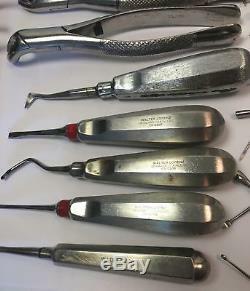 10 large handled dental/oral surgery tools including: 1 W. Lorenz 83, 2 Walter Lorenz 09-0258, 1 Walter Lorenz 09-0306, 1 Walter Lorenz 09-0263. 1 Lorenz Oral Surgery Rongeur 03-0088. Pictures are of the actual item you will receive. 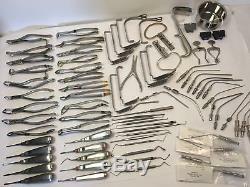 We have surgical instruments, disposables such as gowns, gloves, sutures, pads, etc. And some technical equipment for endoscopy. Regardless of the origin of the equipment, documentation provided or identification appearing upon the equipment, the equipment described and offered here is in no way certified for, recommended for, or offered for any specific use. The sale of this item may be subject to regulation by the U. Food and Drug administration and state and local regulatory agencies. Please be sure you take this into account before you order from Swiftsellit. However, due to the size and weight of some items we sell, there are occasions when we cannot. Please request an invoice for multiple items before paying for a single item. If we overcharged you, we will happily send you a corrected invoice. DO NOT SEND THE ITEM BACK UNTIL WE HAVE A CHANCE TO TAKE CARE OF YOU. WE HANDLE EVERYTHING FROM OUR END. We are always willing to work out issues before they become a problem. Please let us know of any extraordinary circumstances before that happens!! Our office is located in Montgomery County, PA, a few miles from Philadelphia's Chestnut Hill section and about two hours from New York City and Baltimore, MD. Swiftsellit has used its best efforts to inspect the item(s) for sale and create descriptions and furnish photographs that fairly and adequately depict the type, condition and image of the goods at the time of sale. 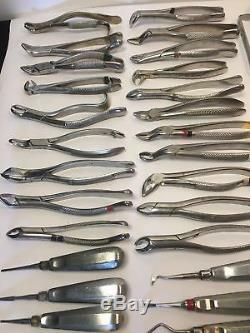 The item "LOT 80+ Dental Surgical Instruments Elevators Extractors Lorenz Mueller Germany" is in sale since Monday, August 13, 2018. 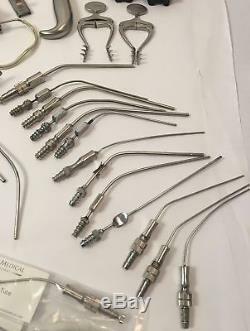 This item is in the category "Business & Industrial\Healthcare, Lab & Dental\Handpieces & Instruments\Other Handpieces & Instruments". The seller is "swiftsellit1" and is located in Glenside, Pennsylvania. This item can be shipped worldwide.